Furman University's first president called Cherrydale home, and now, so do our alumni and friends. Established in 1999, Cherrydale Alumni House is a gathering place for Furman's alumni, friends and students. Listed on the National Register of Historic Places, the Greek Revival home features gracious interior spaces and exquisitely landscaped gardens. The 4,960-square foot house is available for reservations. James Clement Furman, the university's first president, transformed Cherrydale from a modest farmhouse to a grand summer retreat between 1857 and 1860. Following his retirement in 1881, Dr. Furman spent the final decade of his life in the renovated home. For almost 150 years, Cherrydale remained at the foot of Piney and Paris mountains in Greenville. Then, in 1999, the home was donated to Furman. Expert Movers of Virginia used their engineering skills to move the huge home three miles along Poinsett Highway to its present location at the highest point of the Furman campus. 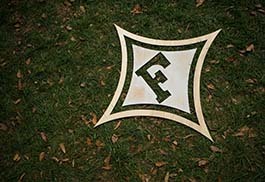 During homecoming that same year, the university dedicated Cherrydale as Furman's Alumni House. Learn more about Cherrydale's history. Cherrydale Alumni House serves as a beautiful venue for intimate gatherings of friends, families and colleagues. Reserve Cherrydale for your next event.